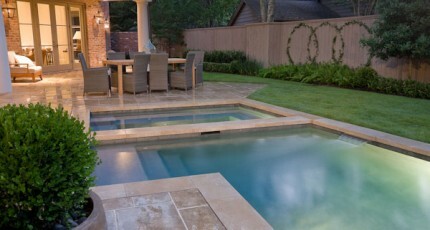 Many Houstonians have come to expect more than a simple concrete patio designed to accommodate seating around a swimming pool. More and more of our residents are looking to add custom patios to their landscapes in order to accommodate the special functions of entertainment, recreation, and relaxation that constitute the essence of true home entertainment. Custom patios are normally built either behind a home or alongside of a home on larger estates, although some of the very large estates in neighborhoods like River Oaks may have them in the front yard as well. The exact location of the hardscape is not nearly as important as the ruling principle of the design itself. A custom patio is built that will reflect the function and nature of specific events, and its size, material build, and physical form is derived from than function in a manner that simultaneously compliments home architecture and surrounding landscape features. 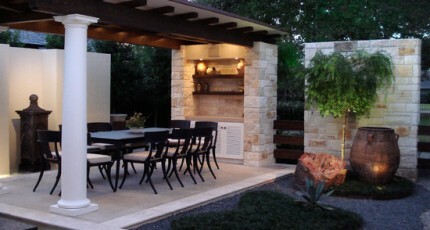 Historically, patios have either been made out of stone, concrete, or wood and have been used as seating areas adjacent to a pool, garden, or outdoor cooking area. 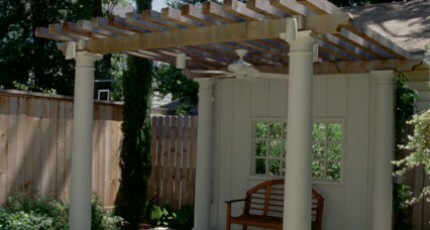 In custom design, though, the patio itself often becomes the center of activity. This is because it is built according to the specific space requirements and anticipated nature of all activities that it is intended to host in the future. Whenever Exterior Worlds works with a new client, we spend extensive time in consultation with our client, gathering as much information as possible on their lifestyle, and on what their intentions are for future home entertainment and outdoor events. We have to factor in such things as the number of guests, the nature of the gatherings themselves, and what structures the patio may ultimately surround or adjoin in order to determine what materials should be used to build it and what its final form will ultimately take. This systematic approach to custom design allows us to construct a patio either around or adjacent to virtually any area of significant interest in the yard. In many case studies, our clients want us to build special seating and gathering areas near custom, lighted fountains or custom gardens in order to let guests enjoy the aesthetic of these elements so that their ambience can help define the experience of the event. Other clients may ask us to build a custom patio in a remote area of the yard to function as their own personal, exclusive, and private retreat for early morning coffee and late afternoon reflections. Still other residents wish to create a festive atmosphere of outdoor revelry and extravaganza where the most sophisticated and ostentatious of outdoor structures are magnified even further by a surrounding custom hardscape that attracts and galvanizes the sensibilities of the crowd. We do a great deal of custom patio construction around large, special outdoor structures that represent an inversion of indoor living into outdoor, expansive space. 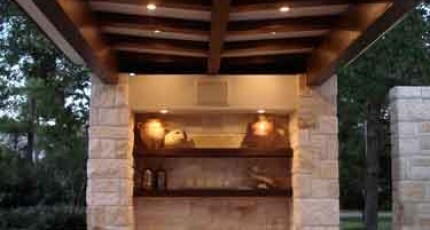 Outdoor fire places and fire pits are two excellent examples of such environments. Based upon the ancient ideals of hearth and home, these archetypal structures invoke both symbolic connotations of special space and also represent images of a warm, traditional, refined modern living room. By building these structures outdoors, and surrounding them with a custom patio based upon the subjective elements of the individual client’s lifestyle, we can unite the experiential, the symbolic, and the Natural all into a new organic/inorganic unity. Custom patios can also be constructed in front of outdoor kitchens and arbors in order to provide extended space beyond the interiors of these structures. Again, our principle of letting function define form not only allows us to extend such space, but to also combine this space with other areas of interest. A custom patio can link the areas between a garden and an arbor, or a pool and an outdoor kitchen, providing a path to walk on, a floor to stand and mingle about, and a seating area to comfortably gather around for quite conversation—all rolled into one. 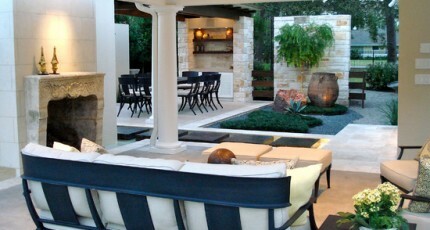 Other locations where we often build custom patios include entrance gardens along the side walls of multi-story homes on larger estates, and around ornately lighted custom fountains that act as centerpieces and focal points for late night parties, formal and informal, festive and relaxed. Landscape architects use only the finest and most durable materials when building a custom patio, and they take the time to ensure that the plans they develop for the hardscape ultimately mesh with the organic and architectural elements of the property. They also make absolutely certain that home architecture and all surrounding structural design elements are respected and complimented by the form, materials, and the size of the patio they build.